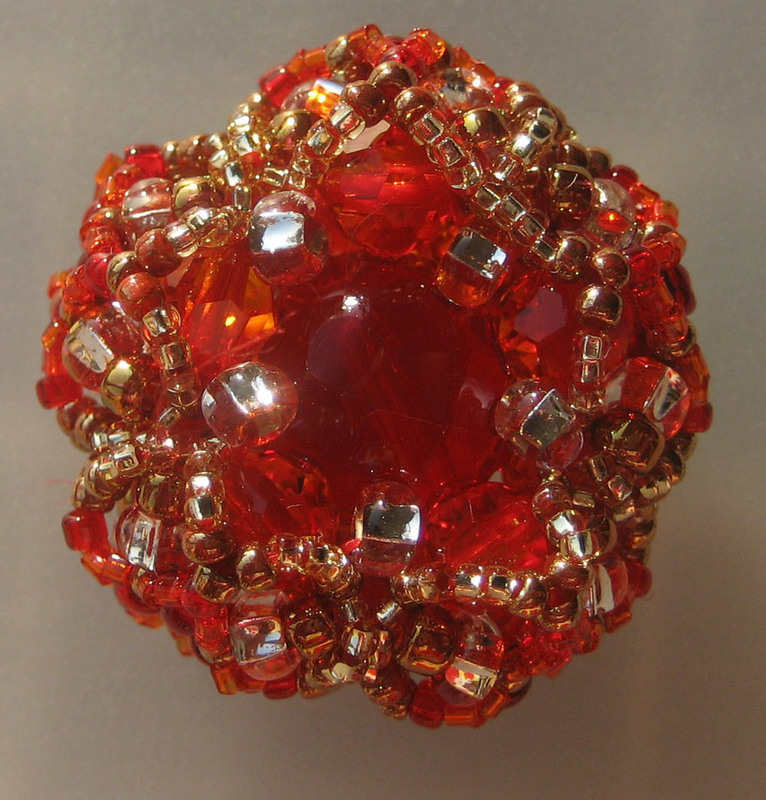 It’s pretty, but a little disappointing: the sparkle of the round orange Swarovski crystals doesn’t really stand out, it’s the clear seed beads and the big red glass faceted bead in the center that really catch most of the notice.Â Still, it’s a very lovely bead. I have managed to get my new laptop up and running and installed with my various weaving software, and decided to celebrate by threading some more of my 1400-thread weaving project (24″ x 60 ends per inch).Â I’ve been threading at a rate of about 3 threads/minute, treadling the threading, which is about 180 ends per hour, which means about 8 hours to thread the whole thing.Â Yikes.Â Well, best to get started right away, if it’s going to take awhile…so I put in an hour or so of work and am now on thread 223. I plan to do some more tonight. I may have to work all weekend, but if not I’m going to try helping Gwen Fisher with her Bat Country project – a tetrahedral “jungle gym” made of baseball bats and baseballs.Â (Do look at the mockup; it’s pretty amusing. )Â needless to say, this is a Burning Man project.Â 🙂 They’re assembling it this weekend as a trial run, and I plan to help.Â The photos alone should be worth it. Off to work!Â I’m running really late.